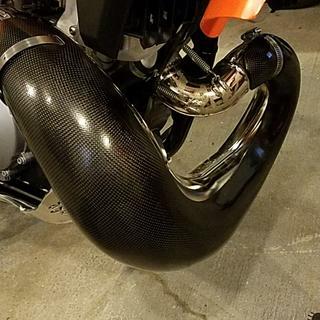 With its design and materials specially constructed for 2-strokes, the Enduro Engineering Carbon Fiber Pipe Guard combines a near perfect amount of strength with the weight-savings of carbon fiber. 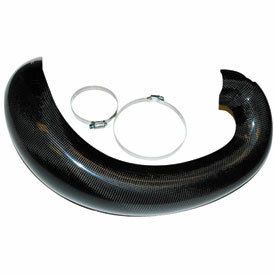 The one-piece carbon fiber guard gives you excellent protection against impact and abrasion and is formed for a precise fit and full coverage of your stock pipe. Since this carbon fiber pipe guard is lighter and stronger than aluminum, two stainless clamps are all that is needed to give the guard an unshakable mount and keep you from having to replace a smashed pipe. 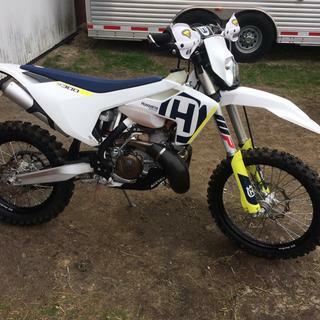 I had a different brand on my YZ250 on a FMF gnarly pipe and the fit wasn’t exact so it took a while to mount. This one from EE for the stock pipe of a 2018 KTM 250XC was a perfect fit. Install took only minutes. It snapped right into place with a little pressure and I didn’t need an extra set of hands to hold anything. 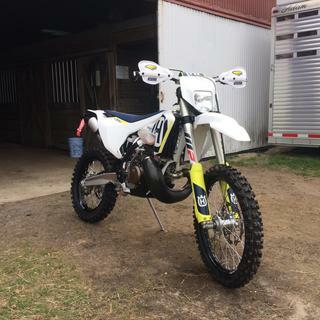 I just bought my first 2 stroke and to keep it all straight and shiny I bought a pipe protector. I am a fan of Enduro Engineering and they delivered again with this product. Very easy installation. 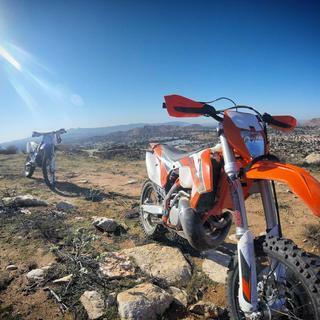 I've used them on other KTM's as well. Look great and hold up well! 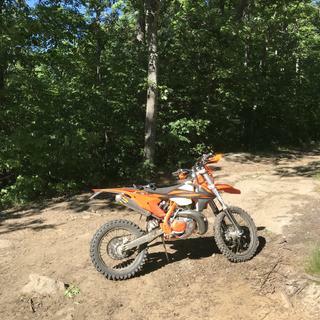 -m-2008 KTM 300 XC--everything fit well. Needs to bend it a bit like all of them but saved the pipe a few times in the last race. 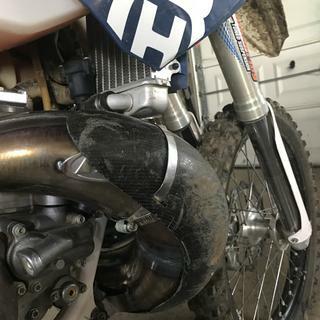 I have an aftermarket fmf expansion chamber and it seems to Have a gap in the middle of the guard and the pipe. This pipe gaurd offers great protection. And fits my stock pipe perfect. Pipe guard looks great and adds protection like it should. Only had it a few rides so don’t know if it will fade like a p3. This pipe guard keeps my pipe protected and looks way good too, Installation with the bullet proof radiator guards was no problem! Purchased online as a result of excellent customer service and communication via the live chat utility. The parts arrived ahead of the estimated delivery time (into Canada) and the quality was top notch. Looks great. Protects pipe. Definitely a tight fit on stock KTM expansion chamber. Fastest delivery I've seen. Good quality product. Good fitment. fitment was a little tough. didnt want to line up. i put this on a brand new ktm, so i know the pipe wasn't bent up. finish could be a little better, but it is only going to get worse i guess. I was shocked how tight and precise the fit was on my 2018 300xcw. Guard snapped on so tight you hardly needed the clamps! (I'm kidding, you need the clamps.) Pretty hard to get mounted up. I found it much easier to pull the pipe off the bike. EE recommends you position the fat clamp with the adjuster at the top. I put mine at the bottom and think it is a better location. Mine came with a new bike purchase, but for the extra few bucks, buy a P3 instead. Much nicer guard and sold right here at Rocky Mountain ATV/MC. Great product with great price! Very good guard for price! Fitment was good, a little snug but once clamped down and on bike for a bit it seemed to seat in nicely. I mounted on stock pipe. Durability is very good so far, I have banged it off a few rocks and it's still I great shape. Amazing quality. Rugged design. Perfect fit. Still on my bike after 80+ hours of HARD enduro riding. It's banged off sharp, tall rocks, it's been smashed up against logs of all sizes, and has skimmed across rock shelves the entire life of the guard. It may look rough now, but has no cracks or signs of being brittle. No dents on the pipe even if the guard has scrapes and gouges. Rigid design and still snaps right into place after 1 year of wear. Many more in my future, when this one ever wears out. Tight fit but it looks good. 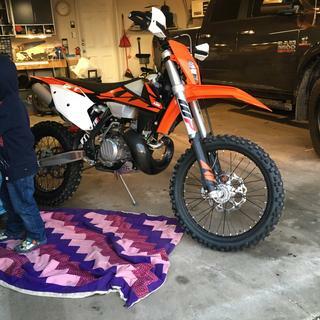 It was a snug fit but once I got it on it looks great in my 2017 Ktm 250 xc-w. Fit awesome! Have owned several different brands for several models and this is one of the nicer fitting and more durable pipe guards! This will definitely protect your pipe! Little tough to get on but fits good when its in place. I have taken a few good hits off the pipe and the guard show that. Pipe isn't deformed or anything so the guard must be doing the job! I have had this on my stock pipe for almost a year now and it still holding up fine. I have smashed it against dozens of rocks as well with a few logs and its still doing its job. Buy this one my buddy paid more for the e line one and its not nearly as strong. This is a good pipe guard till a couple of rides later when it starts really burning/melting and falls apart to where you have to keep moving the clamp to hold it on because it keeps falling apart. On my second one and it is doing the same exact thing... Would not recommend this pipe guard. My dad has a pipe guard from E Line and got it a year and a half before mine and his hasn't burnt up anywhere near like mine has. I have about 60 hours of ride time with this guard and it's holding up great. It has taken many hits and scrapes and my pipe still looks brand new. It's not quite as thick as the P3 guard but so far is holding up just as well. I highly recommend removing the guard after every few rides to clean out any dirt, mud or debris that gets in between the pipe and guard to prevent scratches and rust from forming on the pipe. I put this on my 300xc and I couldn't be happier. It has taken the brunt of all my falls. From rocks to trees and everything else. The guard is damaged but still doing the job. And the expansion chamber is good as new. Worth the money if you want to save your pipe. Massage it into place. It WILL go. I bought this instead of the Moose Racing one because it was a little cheaper. Fits decent but not perfect. Does it's job and looks good......Until you bang it up a bunch but if you are going to use it than you are going to use it and it works well. Light weight. Smells funny the first few rides. Don't worry about it just ride! <br>Guard cracked and it is thinner than some others I got dents in the pipe under the guard. I bought an aluminum one when I replaced this one. Looks better and seems to protect better at a fraction of the cost. This has done a decent job of protecting my pipe but a recent fall made me rethink my previous rave. After talking to a lot of others that have CF guards it seems like the P3 is much better quality and thicker all around, I'm going with that one next. The price difference is negligible and the quality is better on the P3. I'm bummed I have this EE one now. guard seems to be holding up very well, recently put it to the test on a 6 day, 400 mile ride in Colorado Rockies and it held up to some tough conditions and handle some bashings! Fits good and looks good. If your doing woods riding this is a must have....(unless you don't mind dropping some cash on a new pipe)...well worth the price. Good fitting, does its job. Good fitting pipe guard. Does its job after hitting and scraping rocks its scratched up but the pipe is in good shape. I have an FMF Gold Series SST pipe on my KTM 250 XCW and the guard does not fit at all. The pipe is too large. One of the best things I have bought. Saved my pipe a few times guard has some scratches but that is it. I would buy another if something happens to this one. The fit is good & it has held up well. I've also beat this thing up & it continues to function well. It seems like it's better suited for impact rather than abrasions. My fire road slide put some good gouges in it. Also I thought the fit would be better, there are some gaps and moving the guard around the pipe would close up some while opening up other areas. A good light weight choice if you're using the stock pipe. This pipe guard looks like it can take a beating and should definitely protect the stocker. The only downside is that the large hose clamp that holds it on does not lay completely flat against the pipe/guard on the expansion part of the pipe. The other hose clamp at the exhaust point fits much better and installs flat. I have had it on my bike for 9 months now... It is holding up well, showing just a few small scratches... I have had multiple "tip overs", and I definitely feel it has helped protect the pipe. Put the pipe guard just after I bought the bike new, before the first ride to give me some extra protection from the extreme woods riding I do. It's held up well and no dents in my pipe, well worth the money spent and it fits perfect. Not the cheapest, however it fit much better than I expected and is still going strong. Ya get what ya pay for. I bought this pipe guard for both my 13 250XC and our 14 200XCW. The 250 pipe guard fits well and has really good coverage. The 200 pipe guard, which I am reviewing here, leaves much of the pipe susceptible to damage. 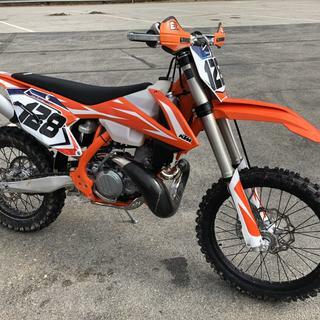 i would not recommend this guard for KTM 200's. Get a P3. Installed this knowing EE makes great stuff , but first race out took a little get off and flopped on the small/shifter side in soft mud and clay didn't really notice it till after the finish but the slot's on the small side actually were broke where the hose clamp goes thru. Now I know I can just put the clamp on the outside but never would I have expected it to break after a little get off it's carbon fiber! So after contacting RM in chat he called EE they said normally crash damage is not covered by warranty,gave me an email address and said to send him some pics and what not and they would work with me on seeing if it's going to be a replacement or not. So all in all the pipe is not damaged so it did it's job, seems like it would have been able to withstand a flop but I'll see what happens and report back the findings from EE. Was kind of a pain in the rear to install because of the hose clamps. Other than that the Carbonfiber guard itself is great quality and fits the pipe almost perfect. I would buy again but recommend getting t-bolt clamps. Will this pipe guard fit an FMF Fatty pipe? It fit my FMF KTM SXS pipe and has done a great job over the last 3 years of protecting it. The SXS pipe and Fatty look very similar so I think it will work. The fit on my pipe was not perfectly flush but like I said it worked and has kept my pipe from getting damaged through lots of off road racing. I'm not totally sure if it will fit but I would NOT buy any EE pipe guards. The P3 is a much better product, it's at least 2x thicker than the EE. If you're bent on the ee guard call them and see what they say. Probably not gonna fit your fmf pipe, the curve of the fmf pipe and the thickness is most likely different than the stock pipe. These pipe guards are mostly brand specific. 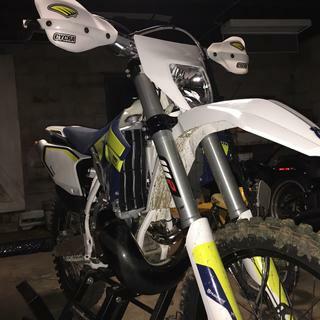 I have an FMF Fatty on my 2015 300xcw and the guard fit perfectly! I don't know, i have the original pipe and it fit perfectly. 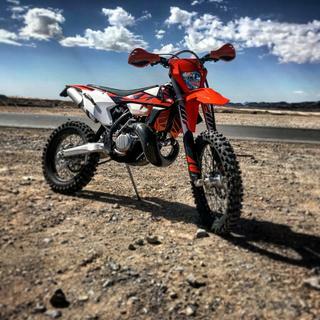 Fits factory Ktm pipe only! Will this fit my pro circuit pipe on my 2006 kx 250? BEST ANSWER: No it will not. Sorry we do not offer one for our application.